The ‘Friday poem’ this week is ‘Last Hours’ from the Pulitzer Prize winning collection, ‘Different Hours’ by Stephen Dunn. The poem is set in an office in 1964 at nineteen minutes to five. The interview began with “how he has used poetry in his own life”. Does our ‘work place’ also gives us a chance to be better than ourselves? Enter ‘the chapel of language’ in the Friday poem, The Last Hours. it’s exactly nineteen minutes to five. My phone rings. it’s a small knot, I’d like to say, of joy. I went for a walk this morning along the beach. It was cloudy, unusual for a summer day in California. I stopped in a parking lot to take a photo of the town’s iconic pier. I looked down for a minute and that’s when I spotted it. 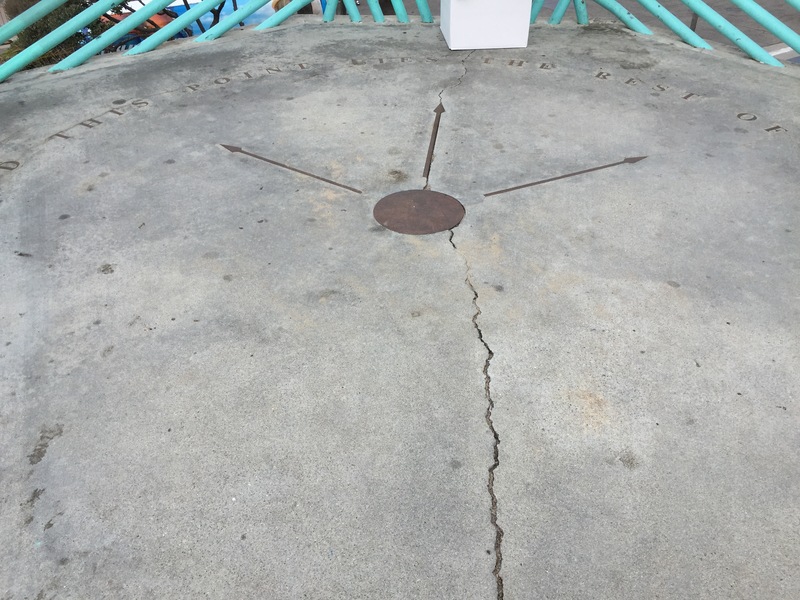 Embedded in the cement, facing the ocean are three directional arrows. 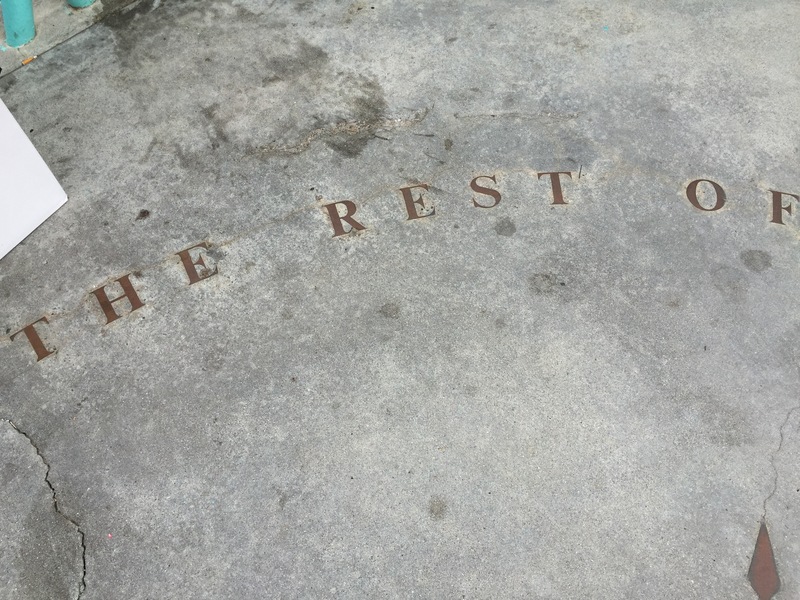 In a semi-circle surrounding the arrows are the words “Beyond this point lies the rest of the world’. 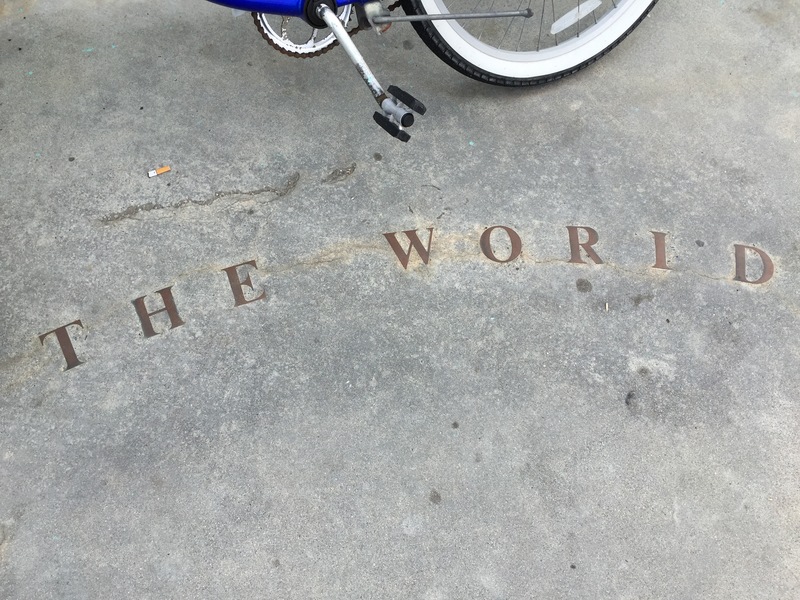 There they were, nine simple words, welcoming visitors to imagine life beyond this point. In writing this blog I have often emphasized the importance of curiosity and creativity, urging readers to step away from what is familiar and risk failure to experience success. Here it is, a perfect invitation to imagination and exploration. You don’t have to travel to California and gaze at the Pacific. Just stop what you are doing, look up and remind yourself that that there is something bigger beyond where you sit. Everyone tells you to ‘network’ to find a job. And yet the majority of us freeze at the thought of connecting with strangers to obtain information about careers. And it’s not just being shy. Most professionals who have made connections to establish business relationships find it difficult to translate those same skills to find a job. Summer gives us an opportunity to ease into the process. We tend to think of networking as a formal meeting that involves lots of preparation in advance. There’s another approach that involves the chance encounter and spontaneous conversation away from the workplace. Vacation travel can offer unique alternatives to test your informal networking skills. Last week while I was waiting for my delayed flight at Newark Liberty I observed a conversation between a pilot and a passenger in the boarding area. At first there was the normal exchange, sharing travel disruptions past, but that was followed with introductions, exchange of business cards and a more in depth conversation about work and life. Amid the chaos of summer travel two professional were networking. It starts with curiosity and a desire to be continually learning. While you are traveling, relaxing on a beach or hiking in the mountains be receptive to an opportunity for unexpected connection. Take a few minutes and disconnect from your electronics and observe your surroundings and fellow travelers. Test your ‘talking with strangers’ skills by noting something about an individual and initiate a conversation. It could be as simple as a comment to someone wearing clothing with a logo of your alma mater or favorite sports team. These random conversations may not result in information directly related to your career advancement. But if you believe we learn from the wisdom of others, the conversations will yield valuable clues to experience, failure and success. Nurture these informal connections along with those directly affiliated with your career field. Keep in touch via social networking. Never underestimate the value of your informal network to inform and influence your career choices. One story stood out from the rest this week@work. Washington Post journalists Emily Badger and Christopher Ingraham reported on the findings of sociologist Mark Rand at Washington University. The title alone was attention grabbing: ‘The remarkably high odds you’ll be poor at some point in your life’. “The poor in America are not a permanent class of people. Who’s poor in any given year is different from who’s poor a few years later. By the time they’re 60 years old, Rank has found, nearly four in five people experience some kind of economic hardship: They’ve gone through a spell of unemployment, or spent time relying on a government program for the poor like food stamps, or lived at least one year in poverty or very close to it. By age 60, nearly 80 percent of us will have gone through a rough stretch. The age of job stability is over, if anyone was still hanging on to an ideal of job security. Financial planning is a critical component of long term career planning. The reality of the research is that there will be periods of economic challenge alternating with periods of affluence. The ‘poor’ are not some abstract population. They are your neighbors, family and friends. A story in The New York Times offered an example of how attitudes toward work and career might alter a family’s income. Journalist Claire Cain Miller writing for the Upshot found that the most recent entrants to the workplace envision planned pauses in their careers. “The youngest generation of women in the work force — the millennials, age 18 to early 30s — is defining career success differently and less linearly than previous generations of women. A variety of survey data shows that educated, working young women are more likely than those before them to expect their career and family priorities to shift over time. The surveys highlighted that two generations after women entered the business world in large numbers, it can still be hard for women to work. Even those with the highest career ambitions are more likely than their predecessors to plan to scale back at work at certain times or to seek out flexible jobs. Recalling the career of journalist Marlene Sanders who died last week, Katherine Rosman shared the story of a member of the generation who achieved professional distinction while being among the first to ‘work outside the home’. “In 2000, Cynthia McFadden, the senior legal and investigative correspondent for NBC News, attended a party given by her friend Jeffrey Toobin, a staff writer for The New Yorker and legal analyst for CNN. There, Ms. McFadden was catching up with Mr. Toobin’s mother, Marlene Sanders, the pioneering television reporter. She asked for her advice on managing motherhood and a career. In summary this week@work – take a walk in the park and consider your career path. Lose the guilt if you are a working mother, and plan for both the expected as well as the unexpected shifts in work/life balance. Last week BuzzFeed Books posted a short quiz that professed to know how old you are based on your reading habits. Go ahead, take the quiz. You may find you have shaved 10 – 20 years from your chronological age. I’m once again enjoying my 23rd year. The good news, we have more time to read, and this year the folks at TED have provided us with over 70 summer book suggestions from speakers and attendees. After reviewing the list, I’ve picked a quartet of speakers and stories they recommend. The ‘Friday Poem’ this week invites us back to a summer lunch hour in the early 1960s. ‘A Step Away From Them’ was written by poet Frank O’Hara. The Times Square of 2015 differs, yet in some ways echoes the observations of O’Hara in 1964. Today electronic billboards create daylight 24×7, parts of the street is a promenade and Uber drivers vie for passengers with yellow cabs. But office workers still pour into the streets at lunchtime as the heat rises from subway grates and bursts of cool air are released by revolving doors. Has social media rendered ‘Tell me about yourself’ redundant? Remember when an employer’s first impression of a candidate was formed in a face to face interview? Today a recruiter will probably make an initial judgement on applicant potential from an online social media presence. Does this mean that some of the traditional interview questions are redundant? In the past, many recruiters would initiate an interview with the traditional ‘tell me about yourself’. This was either a cover for the fact they didn’t have time to review your resume or a sincere effort to encourage an applicant to tell their story in their own words. Today, even a cursory effort at data mining will provide a significant amount of information about a candidate. The good news, if you have made it to the interview you have passed the initial screening. Your challenge, is to recapture ownership of your story and make the connections between the job requirements and your experience. Manage your social platforms to convey a consistent, professional image. Create a professional narrative that links the information on your social platforms to your answers. There is no shortcut to managing your online presence. Establishing your credibility as a candidate begins with a quick inventory of how you are presenting yourself to the world beyond friends and family. Consider your postings from the perspective of a future employer. Does the content add competitive value to your application? Next, visualize yourself as a productive member of the team you hope to join. What does that look like? Craft your narrative to tell the ‘short story of you’ with your first year in the new position as your next chapter. Connect the dots from your online content to your ambition to be hired. ‘Tell me about yourself’ is not redundant. It’s an icebreaker. In a formal interview it gives a potential employer the opportunity to listen to you. You are being asked to provide a general framework for discussion. You set the stage for follow-up questions addressing various aspects of your academic and work life. It’s your opportunity to set the tone for the rest of the interview. Throughout the interview an employer is seeking an answer to the question ‘Why should I hire you?’ Even when the question is not asked directly, your responses should create a successful argument in your favor. How will these strengths contribute to the success of the organization? How does your current situation lay the groundwork for the next step in your career? In ‘Between the World and Me’ the author has brought ‘the vast heavens, to their knees’ and takes on the role of the champion he lost with the passing of Mr. Carr. The ‘Saturday Read’ is not a ‘summer beach read’. It’s an important addition to the canon of the social sciences and business. This book should be required reading for every member of the workforce, educators and in particular, those who pride themselves as leaders of diversity. An excerpt of the book is available on The Atlantic website. Written as a letter to his son, the book needs to be read in its’ entirety. “…Perhaps struggle is all we have. So you must wake up every morning knowing that no natural promise is unbreakable, least of all the promise of waking up at all. This is not despair. These are the preferences of the universe itself: verbs over nouns, actions over states, struggle over hope. “I am in near-total agreement with Coates’s view of this world we share. Yet I did wonder where the stories of black women feature in all this death and plunder. Their names are not included in this work, and I am not the only one who has noticed it. Coates seems aware of the omission, but he still only manages to surface the experiences of black women through their (very real) pain at the death of black men. That lens isn’t Coates’s alone, but it’s one worth interrogating. In fact, Between the World and Me doesn’t aspire to anything so large – or vague – as “overcoming” or “transcending” race to defeat racism. It is simply about surviving, and remembering. Coates’s preoccupation is not with saving the soul of America. It’s urging it, to borrow a phrase you see around a lot lately, to “stay woke”. ‘Between the World and Me’ is a gift to young writers. It’s a testament to the power of the written word amid the distractions of technology’s sound bites. I first encountered David Whyte when a mentor recommended his 1994 book, ‘The Heart Aroused:Poetry and the Preservation of the Soul in Corporate America’. For the ‘Friday Poem’ this week, I was looking for one that reflected a bit of the ‘magic’ of teamwork. My search brought me back to the poet and author. ‘Working Together’ was composed by David Whyte for Boeing to mark the introduction of the 777 jetliner. On the occasion of the ‘fly by’ of the dwarf planet Pluto and in celebration of creativity, engagement and courage in the workplace, enjoy ‘Working Together’.